Havana is located on the northwest coast of Cuba, 145 km south-southwest of Key West, Florida. One of the oldest cities in the Americas and the the largest populated city in the West Indies. Havana has one of the best natural port and harbor facilities in the Western Hemisphere. The older, historic part of Havana sets on the west side of the harbor, while the newer, industrialized portion extends to the west and south of the older, colonial part of the city. Industries include oil refineries, assembly plants, rum distilleries, sugar refineries, cigar factories, textile mills, and packing plants. Most of the people, who work in the Havana industries, live to the west and southwest of the City. The Jose Marti International Airport are 25 km to the southwest of Havana. 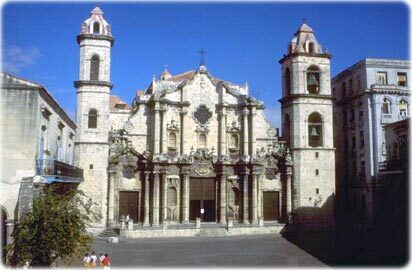 Catedral de la Virgen María de la Concepcíon Inmaculada, finished in 1777, Havana. Copyright © Geographic Guide - Islands of The Caribbean Sea, West Indies.